Cranbrook, BC (August 8, 2018) – Ensuring good visibility and safety for both pedestrians and drivers is behind the City’s renewed call to both residents and businesses to please look after and maintain trees and shrubs along sidewalks and street corners. Concerns continue to be raised around overgrown hedges and low hanging tree branches blocking vehicle sightlines at some intersections and crowding sidewalks for people on foot. Please take some time and examine all of your trees and shrubs on your property along your street and ensure they are not blocking foot traffic or could be a visibility issue for drivers. 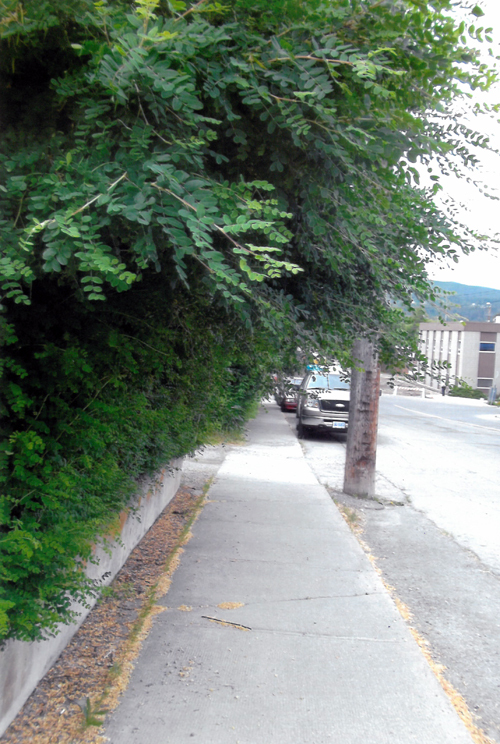 Under the City’s Streets and Traffic bylaw, residents are to make sure that all trees and shrubs are properly trimmed and cut back, so they don’t cause any physical obstruction or visibility issues to pedestrians or drivers on the sidewalks or streets, especially at intersections. The City remains committed to the safe mobility of our residents and visitors either on foot, on bicycle or in vehicles. By keeping sightlines clear and unobstructed through maintaining trees and shrubs, we can continue to keep our streets safe and accessible. If you find any overgrown trees or shrubs on City owned property which may be causing visibility issues, please call us at 311 or use our new 311 app, take a picture of the issue and report it to us.